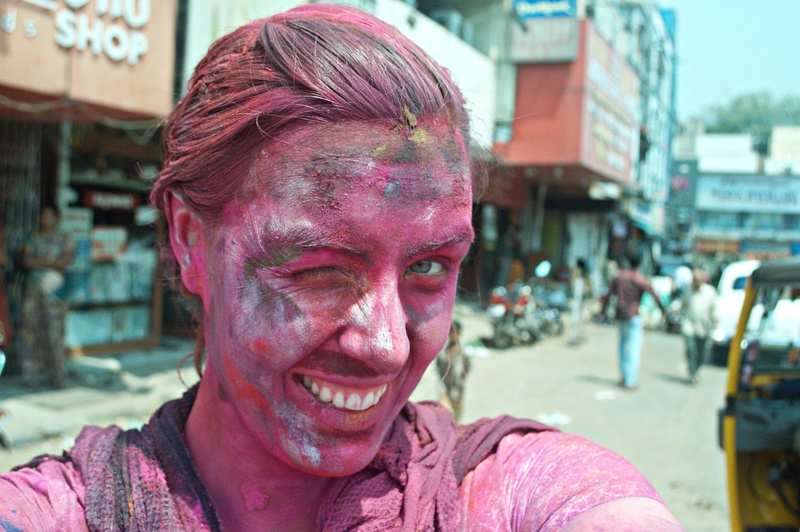 “ So please tell us what Holi means to you..” the local newspaper man says, eyeing my stained dress and color-covered face. “ Holi is a celebration of spring, the celebration of colors, a chance to reduce social inhibitions ” (thank Lily for that one later I remind myself). “And…. ?” The News correspondent pries. I am saved, luckily, by a new group of over-stimulated Indian boys who, attracted by the crowd, run up and start throwing colors at the assembled crowd. The News reporter ducks and scurries to safety, his clean checkered shirt undoubtedly a sure target. The last scene from the videotape is a group of color-splattered youth and men, a few babies in there and us-four foreigners, covered from head to toe in bright pink, blue, purple, green and yellow color, linking arms and shouting “Happy Holi”. Money shot. I actually still don’t really know what Holi signifies. It is at the least a celebration that takes place on the first day after the first full moon of March and typically described as a festival to welcome the colours of Spring. It is perhaps one of the most famous Indian holidays partially because it is such an easy and fun Holiday to take part in. You buy colours and step outside-ideally in a white shirt, and proceed to throw colours at anybody who is either already covered in powder or looks like they are about to cover you in color. Holi isn’t really celebrated in South India at all. My friend tells me that in Mumbai it is close to suicidal to go out on Holi, which is a public holiday there. And after an afternoon in the only place in Chennai where they celebrate Holi (a suburb full of Rajasthani’s and Gujarati’s) I can understand way. Basically from sunrise onwards people get drunk off of Bhang Lassis and run around with color loaded water guns and dry powder, saturating everyone they see. SO awesome. By 11pm at which point it really gets started when all the kids get off school, our group is absolutely covered, head to toe, in an amazing array of paints. Thinking we have found a nice, quiet place to hide we duck into an empty alleyway. Suddenly we are bombarded from all sides with water balloons, water dumped from balconies and pumped from massive super-soakers. We run laughing and cursing through the alley, the dye running through our eyes. Grant, panting, stops out of range of the water bombs, shaking the dye from his hair and is assaulted, yet again, by a stream of yellow water-this time from a two year old little girl with a water pistol standing between the metal railings of her 1st storey balcony. All the grandpa’s who have been watching this spectacle from their balconies crack up laughing. Indeed, Holi seems to endow upon everyone a sense of merriment and joy. As luck would have it when I wake up today there is a massive electricity black-out and no water in our hostel which means I can’t attempt to scrub the rest of the vicious pink paint of my face and still look like, as my friend yesterday so charmingly put it “as if I had stuck my face in a micro-wave oven”. As if that wasn’t bad enough, I also have to give a presentation to the board of my organization. Murphy, it seems, really has it in for me today. But judging from all the jokes and smiles I figure at least I am still bringing the spirit of Holi into my workplace. Indeed a small price to pay for such colourful memories.